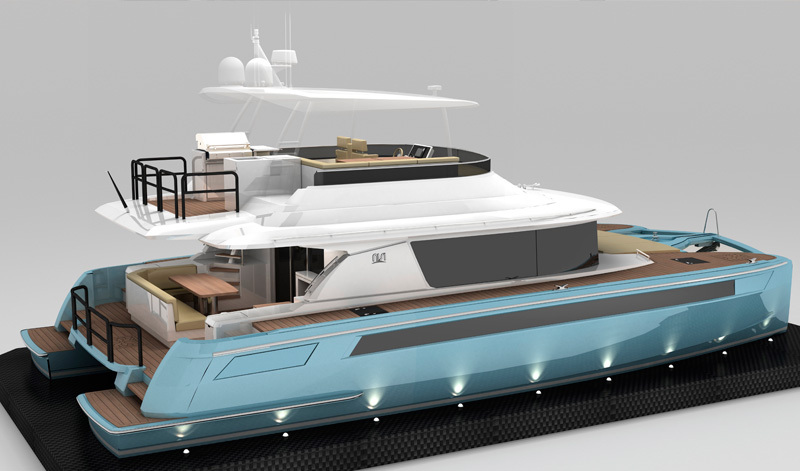 One such boat, is the first model in NISI’s XPRESSO multi-hull series which is due to be delivered to her owner in June 2014. Led by CEO Christos Livadas the wholly European owned builders who have established their yard in the USA, say that the NISI X50 represents the culmination of decades of development and design in the power multi-hull market: a high speed twin hulled yacht purposely designed and developed by people with a unique combination of knowledge and skills. They claim that currently, the X50 is the only multi-hull in the 50 ft (15 metre) motoryacht class with a clean-sheet design dedicated to taking advantage of pod propulsion systems. Pod drives offer greater manoeuvrability, precise control and a high degree of efficiency, particularly on a twin hull yacht, and that advantage is demonstrated by the fact that the X50 offers performance in excess of 30-knots. This has been intentionally over-engineered for a typical owner’s 18-25 knot cruising desires. Also fuel consumption is improved with NISI’s X50’s standard model, delivering 20% better fuel efficiency in the 18-28 knot envelope than a comparable multi hull, and 35% better than a similar size mono-hull. 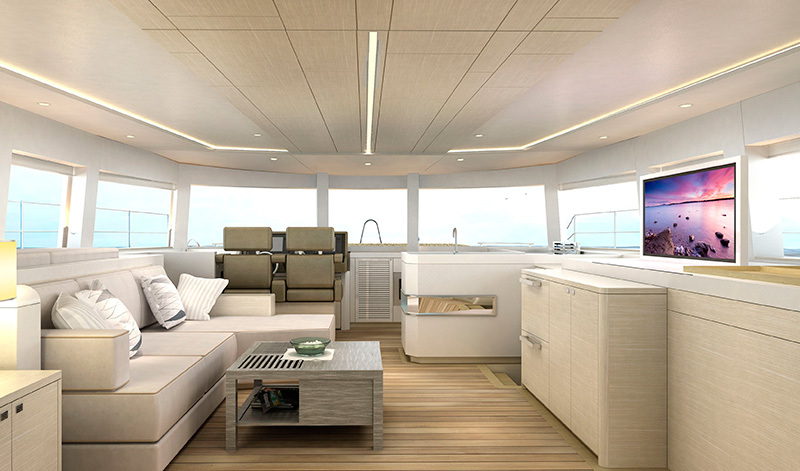 As with any catamaran style yacht, the big benefit comes with onboard space, due to the upper deck accommodation being spread across the width of two hulls. The X50 design enhances the available space even more, by providing a bright modern interior design creatively tinted with subtle shades of beige. And from a comfort standpoint, Multi-hulls by nature deliver a “softer” ride than monohulls. 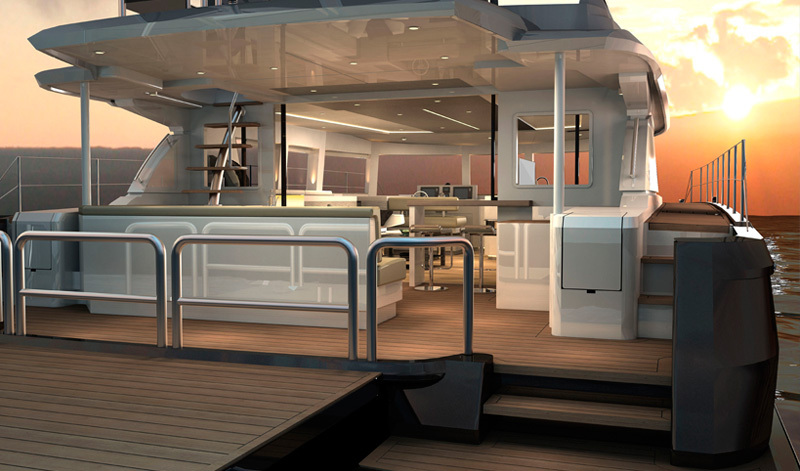 The X50 offers open 360-degree sight lines from all vantage points in the salon deck and helm station. With proprietary structural engineering that draws from proven aerospace and automobile racing design, her construction “cages” the hulls and wing board to tie them together as a single unit, providing more than double the stiffening strength of traditional bulkhead designs.